Back at GDC 2014 in March, Microsoft and its hardware partners first announced the next full iteration of the Direct3D API. Now on to version 12, this latest version of Direct3D would be focused on low level graphics programming, unlocking the greater performance and greater efficiency that game consoles have traditionally enjoyed by giving seasoned programmers more direct access to the underlying hardware. In particular, low level access would improve performance both by reducing the overhead high level APIs incur, and by allowing developers to better utilize multi-threading by making it far easier to have multiple threads submitting work. At the time Microsoft offered brief hints that there would be more to Direct3D 12 than just the low level API, but the low level API was certainly the focus for the day. Now as part of NVIDIA’s launch of the second generation Maxwell based GeForce GTX 980, Microsoft has opened up to the press and public a bit more on what their plans are for Direct3D. 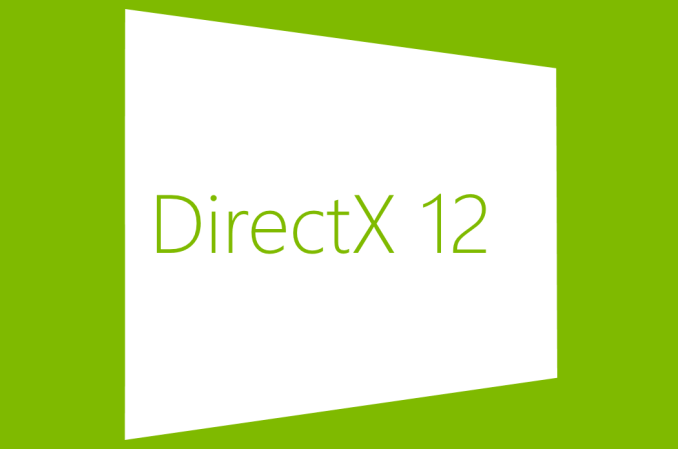 Direct3D 12 will indeed introduce new features, but there will be more in development than just Direct3D 12. First and foremost then, Microsoft has announced that there will be a new version of Direct3D 11 coinciding with Direct3D 12. Dubbed Direct3D 11.3, this new version of Direct3D is a continuation of the development and evolution of the Direct3D 11 API and like the previous point updates will be adding API support for features found in upcoming hardware. At first glance the announcement of Direct3D 11.3 would appear to be at odds with Microsoft’s development work on Direct3D 12, but in reality there is a lot of sense in this announcement. Direct3D 12 is a low level API – powerful, but difficult to master and very dangerous in the hands of inexperienced programmers. The development model envisioned for Direct3D 12 is that a limited number of code gurus will be the ones writing the engines and renderers that target the new API, while everyone else will build on top of these engines. This works well for the many organizations that are licensing engines such as UE4, or for the smaller number of organizations that can justify having such experienced programmers on staff. However for these reasons a low level API is not suitable for everyone. High level APIs such as Direct3D 11 do exist for a good reason after all; their abstraction not only hides the quirks of the underlying hardware, but it makes development easier and more accessible as well. For these reasons there is a need to offer both high level and low level APIs. Direct3D 12 will be the low level API, and Direct3D 11 will continue to be developed to offer the same features through a high level API. Today’s announcement of Direct3D 11.3 and the new features set that Direct3D 11.3 and 12 will be sharing will have an impact on Direct3D 12 as well. We’ll get to the new features in a moment, but at a high level it should be noted that this means that Direct3D 12 is going to end up being a multi-generational (multi-feature level) API similar to Direct3D 11. In Direct3D 11 Microsoft introduced feature levels, which allowed programmers to target different generations of hardware using the same API, instead of having to write their code multiple times for each associated API generation. In practice this meant that programmers could target D3D 9, 10, and 11 hardware through the D3D 11 API, restricting their feature use accordingly to match the hardware capabilities. This functionality was exposed through feature levels (ex: FL9_3 for D3D9.0c capable hardware) which offered programmers a neat segmentation of feature sets and requirements. Direct3D 12 in turn will also be making use of feature levels, allowing developers to exploit the benefits of the low level nature of the API while being able to target multiple generations of hardware. It’s through this mechanism that Direct3D 12 will be usable on GPUs as old as NVIDIA’s Fermi family or as new as their Maxwell family, all the while still being able to utilize the features added in newer generations. Ultimately for users this means they will need to be mindful of feature levels, just as they are today with Direct3D 11. Hardware that is Direct3D 12 compatible does not mean it supports all of the latest feature sets, and keeping track of feature set compatibility for each generation of hardware will still be important going forward. First and foremost of the new features is Rasterizer Ordered Views (ROVs). As hinted at by the name, ROVs is focused on giving the developer control over the order that elements are rasterized in a scene, so that elements are drawn in the correct order. This feature specifically applies to Unordered Access Views (UAVs) being generated by pixel shaders, which buy their very definition are initially unordered. ROVs offers an alternative to UAV's unordered nature, which would result in elements being rasterized simply in the order they were finished. For most rendering tasks unordered rasterization is fine (deeper elements would be occluded anyhow), but for a certain category of tasks having the ability to efficiently control the access order to a UAV is important to correctly render a scene quickly. The textbook use case for ROVs is Order Independent Transparency, which allows for elements to be rendered in any order and still blended together correctly in the final result. OIT is not new – Direct3D 11 gave the API enough flexibility to accomplish this task – however these earlier OIT implementations would be very slow due to sorting, restricting their usefulness outside of CAD/CAM. The ROV implementation however could accomplish the same task much more quickly by getting the order correct from the start, as opposed to having to sort results after the fact. 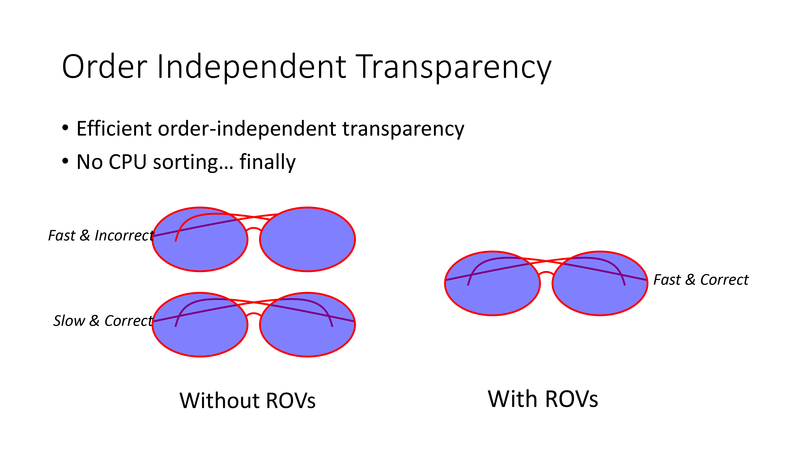 Along these lines, since OIT is just a specialized case of a pixel blending operation, ROVs will also be usable for other tasks that require controlled pixel blending, including certain cases of anti-aliasing. The second feature coming to Direct3D is Typed UAV Load. Unordered Access Views (UAVs) are a special type of buffer that allows multiple GPU threads to access the same buffer simultaneously without generating memory conflicts. Because of this disorganized nature of UAVs, certain restrictions are in place that Typed UAV Load will address. 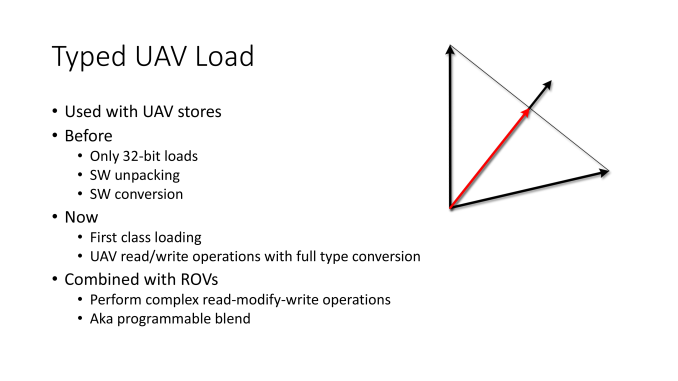 As implied by the name, Typed UAV Load deals with cases where UAVs are data typed, and how to better handle their use. 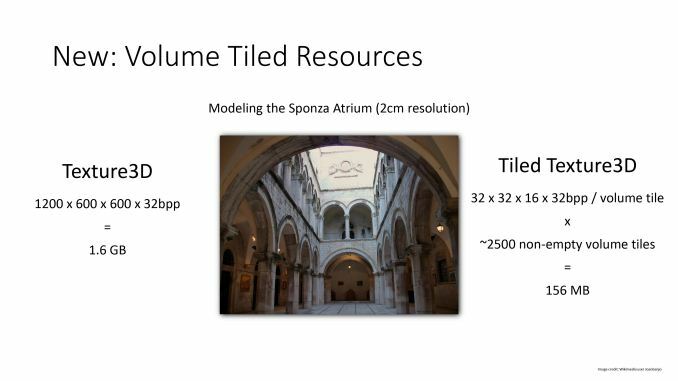 The third feature coming to Direct3D is Volume Tiled Resources. VTR builds off of the work Microsoft and partners have already done for tiled resources (AKA sparse allocation, AKA hardware megatexture) by extending it into the 3rd dimension. VTRs are primarily meant to be used with volumetric pixels (voxels), with the idea being that with sparse allocation, volume tiles that do not contain any useful information can avoid being allocated, avoiding tying up memory in tiles that will never be used or accessed. This kind of sparse allocation is necessary to make certain kinds of voxel techniques viable. 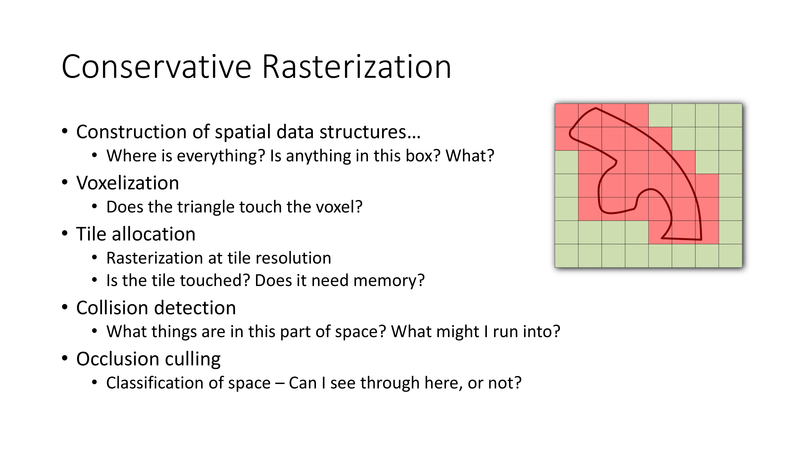 Last but certainly not least among Direct3D’s new features will be conservative rasterization. Conservative rasterization is essentially a more accurate but performance intensive solution to figuring out whether a polygon covers part of a pixel. Instead of doing a quick and simple test to see if the center of the pixel is bounded by the lines of the polygon, conservative rasterization checks whether the pixel covers the polygon by testing it against the corners of the pixel. This means that conservative rasterization will catch cases where a polygon was too small to cover the center of a pixel, which results in a more accurate outcome, be it better identifying pixels a polygon resides in, or finding polygons too small to cover the center of any pixel at all. This in turn being where the “conservative” aspect of the name comes from, as a rasterizer would be conservative by including every pixel touched by a triangle as opposed to just the pixels where the tringle covers the center point. Conservative rasterization is being added to Direct3D in order to allow new algorithms to be used which would fail under the imprecise nature of point sampling. Like VTR, voxels play a big part here as conservative rasterization can be used to build a voxel. However it also has use cases in more accurate tiling and even collision detection. Wrapping things up, today’s announcement of Direct3D 11.3 and its new features offers a solid roadmap for both the evolution of Direct3D and the hardware that will support it. By confirming that they are continuing to work on Direct3D 11 Microsoft has answered one of the lingering questions surrounding Direct3D 12 – what happens to Direct3D 11 – and at the same time this highlights the hardware features that the next generation of hardware will need to support in order to be compliant with the latest D3D feature level. And with Direct3D 12 set to be released sometime next year, these new features won’t be too far off either. My guess is they'd likely have separate feature levels, that way if 12 exposes something 11 cannot do, they can add it to the 12 feature level with bumping the 11 one. If they're continuing to work on D3D11 and increment the version number, leaving it as a "high level" API, I think giving the low-level API the name D3D12 was really stupid and confusing. Should've been something more like "New Direct3D Low-Level 1.0" and "New Direct3D High-Level 1.0", both featured in DirectX 12. Ahh, naming hell.